Long before chat shows, judges and “tabloid infotainment” cluttered up American television airwaves, game shows dominated daytime programming. Several popular game shows of the 1950s and ’60s featured celebrity panelists—To Tell the Truth, Password, What’s My Line, You Bet Your Life, I’ve Got a Secret and Hollywood Squares. Each show had a rhythm and structure to it while still allowing for a cheeky faux pas from celebs and contestants. But none bordered on the madcap mania that erupted from The Match Game. The Match Game is best remembered for its recurring celebrity panelists (Brett Somers, Charles Nelson Reilly, Betty White, and Jack Klugman to name a few) and risqué-sounding questions that encouraged saucy double entendre answers. Take a look at a few clips and you’ll find material that would make today’s censors blush and Marx Brothers-level antics. It ain’t your modern day game show, for sure. And when the series began in 1962, it was quite a different program. The Match Game originally ran from 1962–1969 on NBC with host Gene Rayburn. The game play involved two teams, generally a celebrity team captain and two normal contestants per team answering rather commonplace questions (“Name a kind of muffin” or “Name a popular brand of automobile”). All six contestants wrote their answers on plain cards and hoped to match their teammates. The original series was canceled by NBC in 1963, with six weeks left in the season. Without fear of cancellation, the writers penned funnier fill-in-the-blank questions. The result led to a ratings boost and repeal of cancellation. Frequent celebrity team captains include Ed McMahon, Don Adams, Jayne Mansfield, and, yes, Betty White. Most notable about the original series are the set design—that backdrop would make a lovely addition to any swanky home—and the theme song, Bert Kaempfert’s “A Swingin’ Safari”. Only 11 episodes from the 62-69 run are reported to survive. Episodes were originally broadcast live and were not recorded for posterity. Later episodes were recorded to tape, but NBC followed the BBC’s example of recording over tapes in the interest of saving money. The Paley Center for Media in NYC holds nine black & white episodes and one color episode, all recorded in kinescope. This early incarnation of Match Game is considerably more demure than the bawdy re-imagining of the show. The 1970s brought a new set, a new game structure, and a new microphone for Gene (a Sony ECM-51 model, if you’re looking to complete your retro game show host Halloween costume). “A Swingin’ Safari” was traded in for a original theme by Score Productions. Score Productions was also responsible for the themes to The Price is Right, Family Feud, What’s My Line?, and Concentration. The Match Game’s second series ran from 1973–1982 and played host to some of the era’s most recognizable faces, including Robert Vaughn, Gary Burghoff, Marcia Wallace, and Adrienne Barbeau. 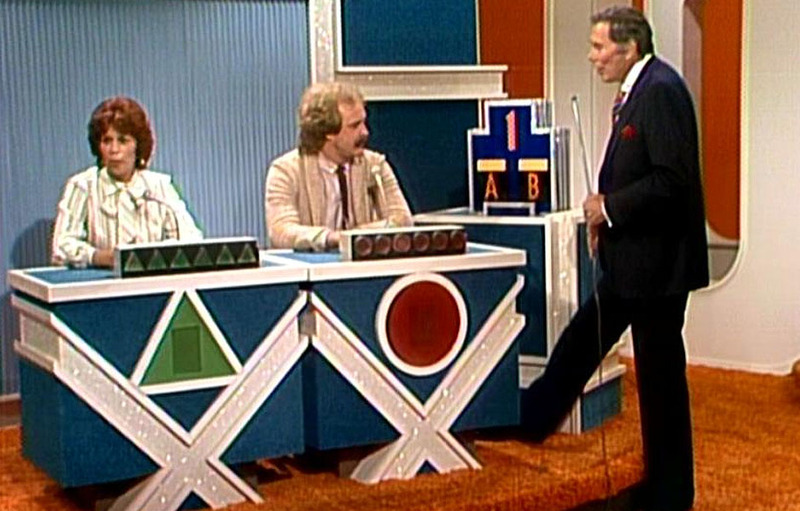 In its nine-year run, Match Game ‘7x must have had its boring moments and slow, straightforward game play. But it was also full of colourful moments—panelists taking over as host for a round, celebrities swapping costumes mid-game, and Gene even getting into some of the action himself. You’d never see Pat and Vanna randomly switch roles or Alex Trebek argue with a judge on-air. And you thought the show was just racy innuendo! It’s well worth a rainy Sunday indoors to watch clips from the series and see all the mod, mod fashions of the contestants, the panelists, and Gene Rayburn. You may take absolute delight or you may rue the day color television was invented. Fun fact: Family Feud is essentially a spin-off of Match Game’s Audience Match round. Frequent Match Game panelist, Richard “The Kissing Bandit” Dawson was tapped to serve at the first Family Feud host.